The best word I can use to describe Jordan is 'magical'. This is a land that has been relevant in history for more than 2000 years. The Romans were here. Moses was here. 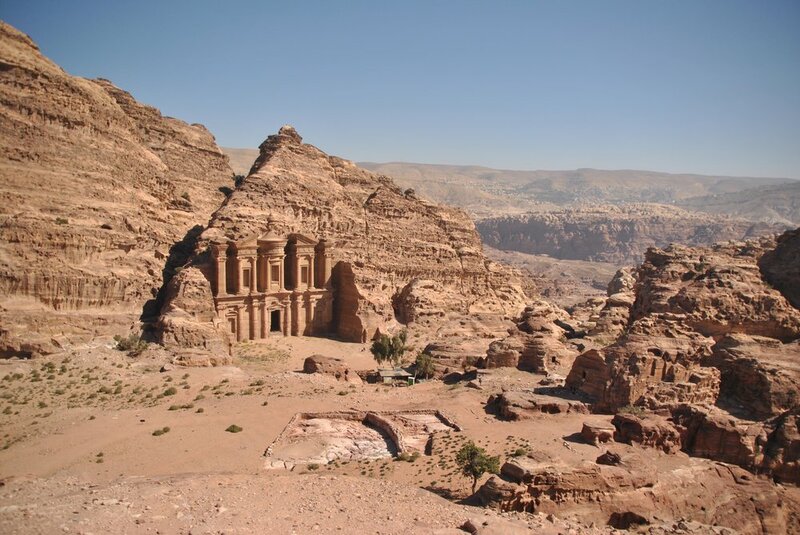 The Arab Nabataeans inhabited the Lost City of Petra long before both Moses and the Romans. The energy throughout the country is alive. Each place you visit a little better than the last. I still look at my own photos and wonder if it wasn't all just a dream. Have you ever considered traveling to Jordan? If yes, let's do this! This post is the perfect place to begin designing your itinerary. If no, we're happy you're here. We hope it's a small sign that we might convince you in the very near future! Where in the world is Jordan? What will I see or visit while I'm there? Who should travel to Jordan? What time of the year should I go? For how long should I plan to travel in Jordan? What other nearby countries should I visit while I'm in this area of the world? What will I eat in Jordan? Can we drink? What should I wear? What budget should I plan for in Jordan? What are the visa requirements for American citizens? Where is Jordan? What countries border Jordan? Jordan is a small country in the Middle East that borders Israel, Syria, Saudi Arabia, and Egypt. What will I see or visit while I’m there? Petra: Jordan is most famous for Petra as it was named one of the New 7 Wonders of the World that were announced in 2007 (along with the Taj Mahal, Machu Picchu, Chichen Itza, Christ the Redeemer, the Great Wall of China, and the Colisseum). ***Make at timeline with graphics to show the Petra is the oldest, built around 312BC. Many people will recognize the iconic Treasury of the Lost City of Petra, but don’t realize that this ancient city is in fact 36 square kilometers large. There are many areas within the city to explore, and we recommend staying 1-2 full days. Wadi Rum is the most magnificent of Jordan’s desert landscapes. The entire area is a UNESCO World Heritage Site. Here you can learn about the Bedouin lifestyle, ride camels, a hot air balloon ride is highly recommended for the scenery, and also, with no large cities nearby, the perfect place to go on a night walk to see the stars. Wadi Rum was featured in the movie Lawrence of Arabia and The Martian (Matt Damon). 1-2 full days recommended. 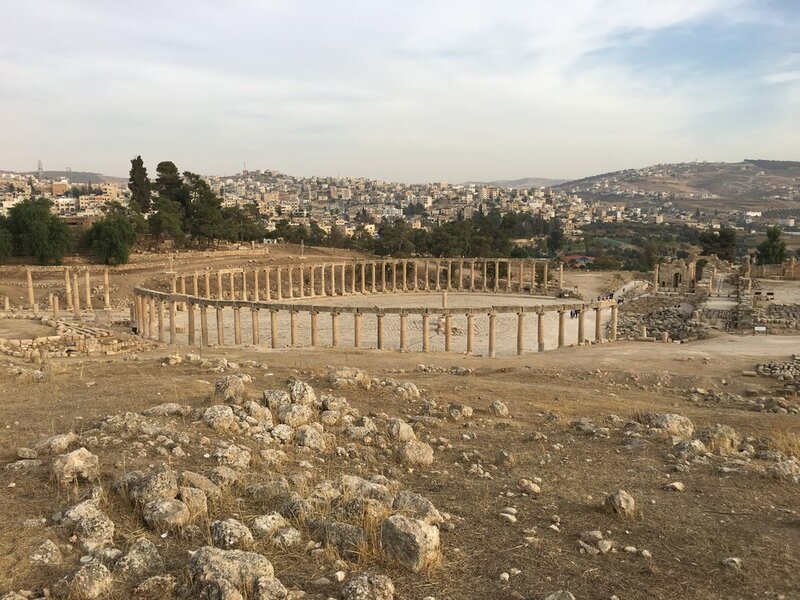 Jerash is a small city just north of Amman, where one of the best preserved Roman provincial towns in the world can be found. The Romans occupied this area 1500 years ago, but it is evident that they built on, over, or expanded upon what had been left by the Greeks, 6500 years ago. Madaba/Mosaics: The Eastern Roman Empire is also known as the Byzantine Empire, and they began to build Roman cities and churches throughout Jordan from the 4th Century AD. One sign of their wealth and prosperity at this time can still be seen in the mosaic floors of their churches. There are 295 Byzantine churches that can still be found throughout Jordan, and Madaba is known as the city of mosaics as there are 35 mosaics in this small city alone. Here in Madaba is the most famous mosaic from the 6th century, which is a map of the Holy Land, or as it’s also known, the Mosaic Map of Palestine. This map was made with more than 2 million pieces of local stone. Because local stones were always used in the making of these mosaics (and not paint), they all look as they did 1500 years ago. Desert Castles: There are many theories about the use of these desert castles, but because they lack the typical defensive architectural design, it is believed that they were used as recreational retreats. Some theories suggest that rulers came to these castles to maintain their relationships with the Bedouins, or to escape the epidemics which swept through the densely populated cities. Wadi Mujib: a wildlife reserve in a gorge along the Dead Sea; there are many hiking trails throughout the protected area. Depending on the time of year you go, some of the trails will turn into wet hikes! Bethany Beyond Jordan is a site near the Jordan River where it is believed that John the Baptist preached and baptized. It was here that Jesus Christ came to be baptized, so this area has also been called the Birthplace of Christianity. Mount Nebo: This is where Moses was able to look out over the promise land that he would never reach. It is believed that he was buried somewhere near this location. Aqaba is a resort town located on the Red Sea which is famous for snorkeling and scuba diving, or just having a couple days of rest and relaxation at the end of your trip. There is truly something for everyone in Jordan. If you like to take active vacations, there are a multitude of nature reserves and protected areas; An entire trip could be designed solely around the biblical sites; If you prefer the history and culture of the area, an itinerary could be filled with Roman ruins, Byzantine churches + mosaics, and Ottoman desert castles. And of course, we can always design an itinerary that includes a little bit of everything! Jordan offers a Mediterranean climate, so travel to Jordan is possible year round. From May to October, the weather is very sunny and 80 degrees Fahrenheit throughout the day, which is warm, but not impossible. Because you will spend the majority of your travels in Jordan outside and quite active, we recommend traveling in the Spring, between March - May, or in the Fall, from October - November. This will offer more comfortable temperatures, less crowds, and in the spring, there will be a lot more greenery. How long should I plan to travel in Jordan? I would recommend an absolute minimum of 7 days in Jordan. One week would enable you to see all the highlights of Jordan. For example, during my 7 days, I visited Amman, Jerash, Madaba, Petra, Wadi Rum, and the Dead Sea. But, I did not have time for the desert castles and the nature reserve area such as Kerak, Wadi Mujib, or the Dana Biosphere Reserve. I also was not able to visit Aqaba. So, you can see that with those places, I have another 7-10 days in which I can return to see new things! What other countries can I visit while I’m in this area of the world? Depending on the amount of time you have, I would highly recommend combining your visit to Jordan with Israel and/or Egypt. Not only are they geographically close, but a lot of their history and culture overlaps, so they make sense to combine into one trip. At the same time, you will find biblical history in both Israel and Jordan, and you will find Roman ruins in both Jordan and Egypt, but both Israel and Egypt have their own experiences to offer and could definitely be separated into a future trip. Jordan is one of the most liberal countries in the region. Alcohol is available, but only in the international hotels and resorts. If you go out for dinner to a local restaurant, they most likely will not serve alcohol. Although they are one of the most liberal countries in the region, it is still important to be respectful of their traditions. Please consider covering your knees and elbows, and of course for women, be mindful of the neckline on your shirts. What budget should I plan for while traveling in Jordan? Jordan is not an inexpensive country. For one week, you should plan on $1,500-$2,000 per person minimum, not including your flights. This would be for a small group tour. The price will increase accordingly if you prefer to travel in a small private group with your family or friends. Please check the most updated visa requirements for American citizens here under "Entry, Exit, and Visa Requirements". Can we rent a car and self-drive through Jordan? Yes, of course. But, hiring a local driver often adds to the experience tremendously. Not only will they get you to each destination without any unforeseen challenges, they will often serve as a very knowledgeable guide on the road as well. Hiring a local driver in Jordan is not as expensive as in other countries (Europe, for example), so we recommend this option to our clients. Would you like help hiring a reliable, knowledgable driver for your time in Jordan? We would be happy to arrange your travels with our trusted partners! Contact us here. Specifically speaking about the Middle East, and about Jordan, it’s important to consider information from a variety of sources. We always have the media and the governmental websites such as travel.state.gov where they will post about travel warnings and advisories. But, apart from these sources, it is also important for me to look at the travel companies that are operating tours within each country. They are the companies that have people working in that country each day who are local and from these countries. If anything is happening, or if it seems that a challenging situation is developing, they will most likely know before the news is able to report about it. These companies are large and very reputed around the world, so of course, they will not operate tours in countries that they believe isn’t safe and secure for their travelers. Jordan did not participate in the Arab Spring that began in late 2010, and their King has always spoken out with messages of peace and stability. Although Jordan is a muslim country, they are one of the most liberal and accepting in the region. Jordanians are multi-cultural, multi-denominational and very educated. They do respect the muslim religion, but they do not force any religious practices on their citizens. I can’t guarantee safety, anything can happen anywhere in the world. It's important to always remain aware of your surroundings, to travel with a companion when possible, and to not carry valuables on your person. This advice rings true no matter where you travel! Best of luck to you in your planning endeavors. If you have any further questions, please leave a comment below!